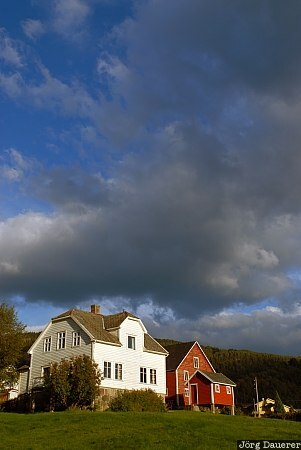 Warm evening light illuminates a house in Hafslo with clouds and blue sky in the background. Hafslo is on the shore of Hafslovatnet in Sogn og Fjordane in the southern part of Norway. This photo was taken in the evening of a sunny day in September of 2010. This photo was taken with a digital camera.